Wanting to only lift the front of your Ford? 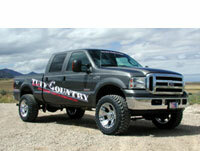 Checkout a leveling kit from Tuff Country EZ-Ride Suspension or Daystar. These kits keep the front end from sitting lower than the rear. Offering F150 kits that use either torsion bar keys or coil / strut spacer. Ford F250 and F350 models use coil spring spacer. All kit maintain a factory or near factory ride. At Suspension Connection we offer kits to level almost any newer model Ford truck. Kits by Tuff Country and Daystar are custom fit for an easy installation and maintain a factory or near factory ride. Below are specifics on how kits are designed and fit on different models. One of the most popular trucks of all-time is also one of the easiest to level. The earliest F150 models that we offer leveling kits for fit years from 1980 thru 1996. These kit simply use coil spacers that insert into the factory coil springs. 1997 thru 2003 models changed from coil spring front ends to torsion bars. These Ford F150 kits by Tuff Country use new torsion bars keys which reindex the factory torsion bars to level the truck. Lastly Ford F150 models built from 2004 to current utilized a spacer that mounts above the factory struts /coils. These leveling kits will lift the F-150 while maintaining a near factory ride. Kits for the F250 / F350 are limited to model years 1999 or newer. Ford 2wd trucks vs 4x4 trucks will vary greatly in how they are leveled. 2wd F250 and F350 models all use a poly coil spring spacer that mounts above the coil springs. Ford F250 / F350 models with 4x4 utilized leaf springs from 1999 thru 2004. Our most popular kit adds leaf packs to your factory leaf springs along with a track bar bracket. 2005 to current models went back to coil springs. These leveling kits use coil spring spacers made of 1/4 inch steel. Ford's midsize truck the Ranger is a popular vehicle to level. Daystar's poly coil spring spacers are available for models from 1983 thru 2007. In 2008 Ford changed the front end to torsion bars. Tuff Country's kit includes new torsion bar keys to fit models from 2008 to current.